This is one of those simple yet satisfying dishes which can be made over and over again. Serve as is with salad as a light meal or as a side dish with braaied meat, etc. Peel and dice the potatoes, place in a saucepan and with the water and bring to the boil. Reduce heat, cover and simmer gently until the potatoes are completely tender and dry. Mash very well with a potato masher and beat in the milk, butter, salt and pepper. Meanwhile, place the butter and onion in a saucepan and stir-fry gently for 5 minutes. Add the fish and stir-fry for a further 5 minutes, stirring from time to time. Spoon the mixture into an ovenproof dish of a suitable size, sprinkle with salt, pepper and half of the parsley and cover with the sliced egg and mashed potato. Smooth evenly and set aside while making the cheese sauce. Melt the butter and flour, remove from the heat and stir in the milk. Bring to the boil, beating with a whisk, until a smooth sauce is formed. Beat in the cheese and seasoning and pour over the potato layer. Bake at 180 °C for about 20 minutes or until bubbly and golden on top. Sprinkle with the remaining parsley and serve with salad or vegetables. Top with a little extra cheese and black pepper and bake about 20 minutes or until browned on top. for a luxury pie, add about 200 g peeled and deveined prawns to the fish before stir-frying, or cooked, peeled prawns before covering with the sliced egg. Recipe by Carolié de Koster from the Art of Cooking recipe book p. 162. Dumplings probably originates from peasant cuisines of various parts of the world where soups and stews feature al lot. That is soups and stews with lots of vegetables and a little meat. Dumplings, added to the soup or stew, are a simple and economical way of stretching the amount of servings. The dough for most dumplings are based either on wheat or maize, or on one of vegetables from which bread dough can be made, e.g. potato, pulses, etc. Place the potatoes and water in a small saucepan and bring to the boil. Reduce the heat, cover and simmer gently until completely tender and dry. Mash thoroughly and beat in the remaining ingredients, adding extra flour if necessary to form a stiff batter. Place spoonfuls of the dumpling mixture onto the meat stew and cover with a lid. Simmer gently for about 10 minutes or until the dumplings are cooked through when tested with a metal skewer. Lift off the dumplings and spoon the stew into a hot serving dish, placing the dumplings neatly on top. 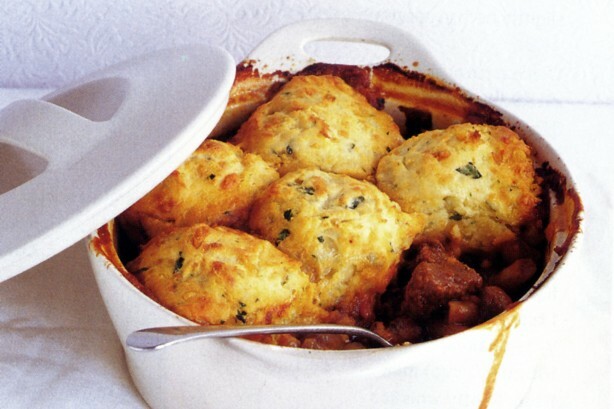 Also see the recipe for Hungarian Goulash with savoury potato dumplings. 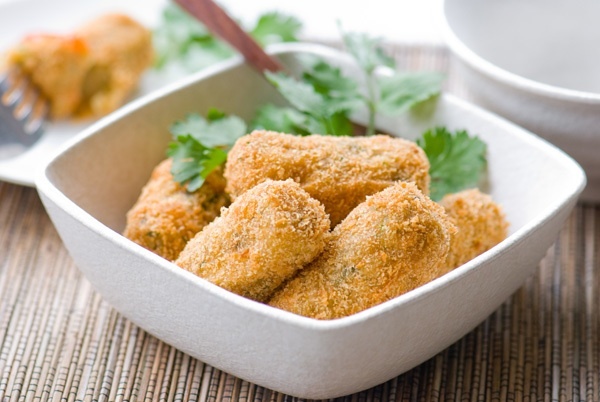 Croquette, from the French croquer, “to crunch”, is a small breadcrumbed fried roll that usually has mashed potatoes and/or ground meat (veal, beef, chicken, or turkey), shellfish, fish, cheese or vegetables as a main ingredient. It is usually shaped into a cylinder, disk or oval shape, and then deep-fried. Peel and quarter the potatoes and place in a saucepan with the water. Bring to the boil and simmer partly covered until completely tender and quite dry. If not dry enough the mixture will be too soft to handle and shape into croquettes. Remove from the heat, mash the potato very well with a potato masher and add all the remaining ingredients. Mash well until a smooth, thick mixture is formed. Allow to cool. Divide the mixture into 12 equal portions and lay the portions on a Wizbake sheet. Roll into neat cylinders or patties with floured hands. Coat with flour, dip into beaten egg and crumbs and refrigerate until required. Pour enough oil into a large deep saucepan to fill it to a depth of 6 to 8 cm and heat to moderately hot. Fry the croquettes a few at a time until golden brown and crisp. Drain on absorbent paper and arrange in one layer on an ovenproof serving platter. Serve immediately or allow to cool and reheat at 220°C when ready to serve. Sprinkle with parsley just before serving and serve as the starch of the meal. The potato mixture into balls or sausages instead of patties. Recipe by Carolié de Koster from Art Of Cooking p. 401. This recipe is very versatile. Serve as is or let every diner tailor-make it to his/her liking by having a variety of toppings available and to let everyone help themselves. Rub the potatoes with oil and wrap each one in a square of foil. Place the potatoes on a baking tray and bake at 180 º C for at least an hour or until tender right through when pierced with a metal skewer. Oven the foil and press each potato gently all over to soften the cooked potato. Make two deep incisions crosswise on top of each potato and press to open up the potatoes and make space for the filling. 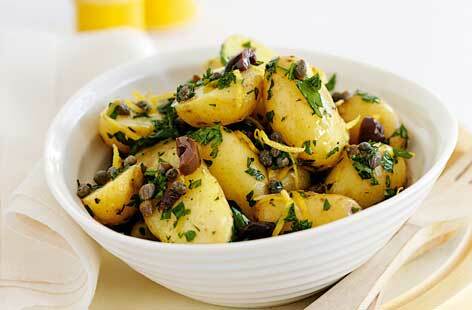 Sprinkle lightly with salt and mix it lightly into the potato with a fork. 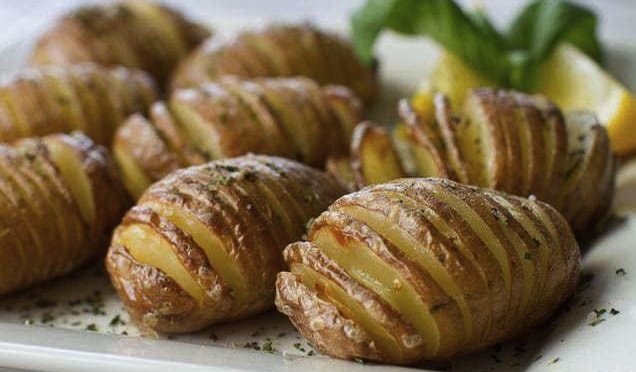 Scrunch the foil around each potato to make an attractive container and keep warm until ready to serve. 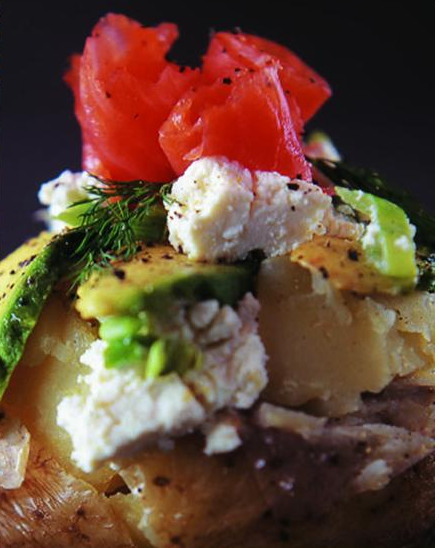 Mix the cottage cheese or feta with the spring onion and divide half of the mixture between the potatoes. Cover with avo slices, sprinkle with salt and cover with the rest of the cheese mixture. Place the smoked fish or bacon on top and serve immediately. Substitute the feta with 250 g plain chunky cottage cheese and the bacon for 120 g smoked trout or salmon for a healthier version. Saddlepback potatoes, also known as Hasselback or Accordion Potatoes, are essentially a Swedish recipe which has traveled over time to various parts of the world. Although not very different from Baked Potatoes, the Saddleback recipe has a unique identity of its own. Once cooked, the preparation is crusty on the outside and soft on the inside. The recipe has its roots in Sweden and is named after Hasselbacken, a Stockholm restaurant which first served the preparation in the 1700s. After becoming a favorite of the people in Stockholm and Sweden, the popularity of the dish spread. The potatoes are a common household preparation and are served in restaurants and eateries around the world. Pre-heat the oven to 200 º C for for baby potatoes or 210 º C for medium potatoes. Peel the potatoes or leave them unpeeled if preferred – be sure to scrub the potatoes very well with a vegetable brush if you are planning on leaving the skin on! Work with one potato at a time and place it on a chopping board on its flat side with the wide side facing you. Cut the potato across the top with a utility knife in 5 mm intervals. Do not cut deeper than one third of the height of the potato, i.e. only cut until the knife disappears, then stop cutting. Place the butter and oil in a roasting pan and heat it in the oven until sizzling. Transfer the potatoes to the roasting pan and coat them in the oil mixture on all sides. Take the Maldon salt between you fingers and crush it before sprinkling it onto each potato. Roast the baby potatoes for about 40 minutes and the medium potatoes for 1 hour 15 minutes. Turn the potatoes halfway through the cooking time and spoon the oil mixture over them. 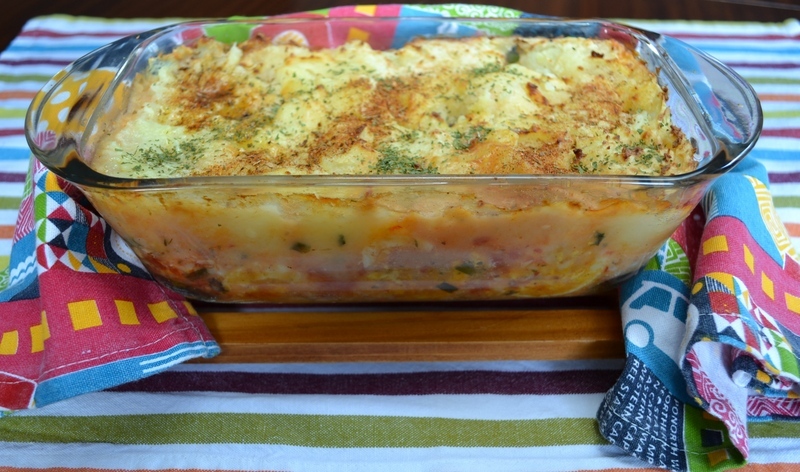 Transfer to a warmed serving platter and serve as the starch component of a meal. Baby potatoes should be about 60 g each and the larger potatoes 100 g each.